← A decision to make – to go north or south? France is actually a large country when you’re trying to decide where to go and what to see – bit obvious I know, but I just hadn’t realized before how big it was. Anyhow, I decided to leave Belgium and the Netherlands for another time and start heading down towards Spain and Portugal. Also, since I’d been to St Michael’s Mount in England I decided to visit Mont St Michel here and that was on the way – sort of!!! 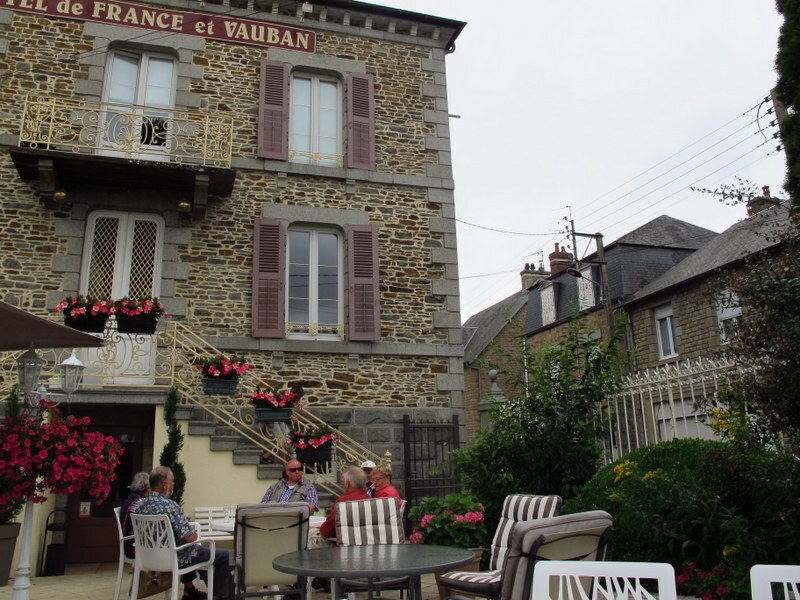 Once again my choice of accommodation was more or less guided by proximity to the train and price – of course, but being a popular tourist destination in France prices were a bit steep even in little Pontorson. Although the hotel was fairly close to the train station I still managed to have trouble finding my way, not hugely lost, just a little off track – bewildering!! But, once I found it, the Hotel Ariane turned out to be a good find; lovely people, a bar and a nice leafy outdoor area just to name a few of it’s charms. It wasn’t difficult to find where to catch the bus to Mont St Michel either. Totally surprising is how I’d say I found Mont St Michel! I was so not prepared for the number of buses and tourists. I’ve found out since it is the 3rd most popular tourist destination in France!! Needless to say the island was quite crowded, more so around the shops than higher up and in some parts of the abbey itself; but with a little effort I found a couple of quiet spots to have a picnic lunch and a sketch or two. 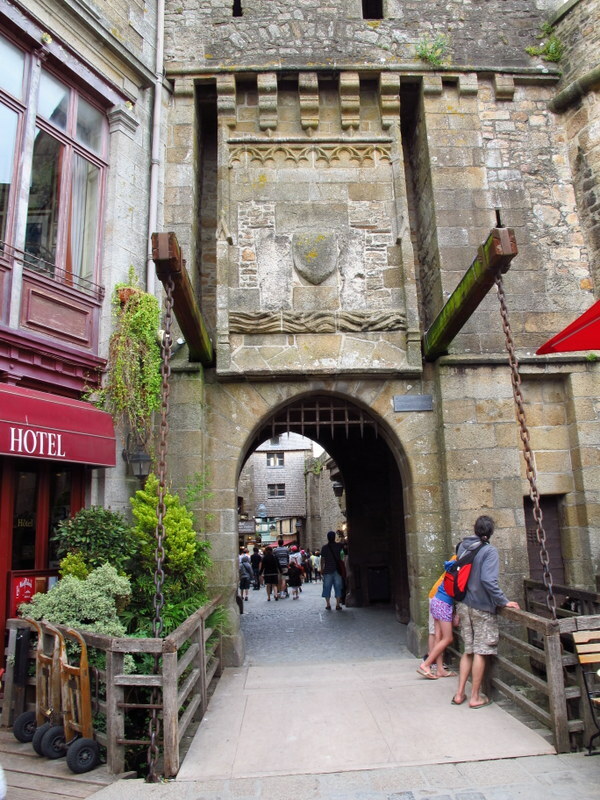 The entrance to the town is through an ancient fortified guardroom and gates with a huge porticullis – all chock a block with tourists and modern day trappings but still very intriguing. 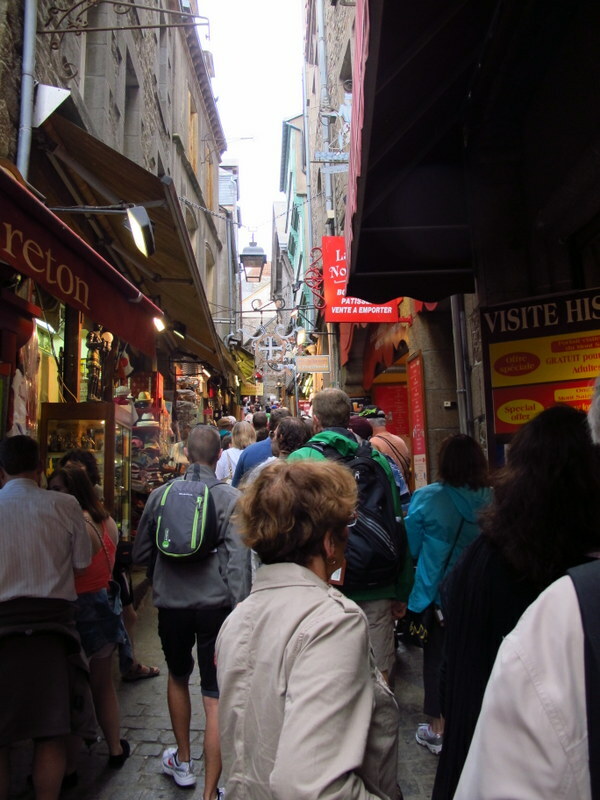 The narrow main street through the village is crowded on both sides with shops and restaurants. If you keep following along behind the people in front eventually you get to the Grande Staircase leading to the Abbey. The first church on the island dates back to the year 708 with the abbey, monastery and fortifications being added through the next few hundred years. It was also used as a prison for political prisoners during the French Revolution. The cloisters and refectory, the views from the ramparts, as well as the giant tread-wheel down in the foundations were highlights. I’d love to have been able to stay on the island and enjoy it after dark with-out the crowds, but we can’t have it all can we. Sketching on Mont St Michel – good thing I ve improved since then!